Galveston Island has been occupied since the early 1500s; it has served as a home to Indians, pirates, businessmen and entrepreneurs. Named for Bernardo de Galvez, a Spanish colonial governor and general, Galveston was officially incorporated as a city in 1839. The move to become a city began in 1836 when Michel B. Menard, a native of Canada, purchased a “league and labor” of land for $50,000 from the Austin Colony. His intent was to establish the City of Galveston. His city started with seven square miles. However, Menard needed more money to promote the town, and therefore, he sought support from others. The nine men that assisted Menard included Gail Borden, Jr. [publisher of the Telegraph and Texas Register and inventor of condensed milk], Samuel May Williams [former secretary to Stephen F. Austin and a successful merchant], Thomas F. McKinney [Williams’s mercantile partner and an early cotton trader], William H. Jack [a Texas patriot and distinguished statesman], A.J. Yates [loan commissioner for the Republic of Texas], John K. Allen [a founder of Houston], Mosely Maker [a lawyer and patriot], James Love [an eminent jurist and successful planter], and David White [an investor from Mobile, Alabama]. This group united to form the Galveston City Company. In 1837, the Congress of the Republic of Texas made Galveston a port of entry and appointed Borden as Collector of Customs. Several prefabricated houses arrived from Maine in 1837; these included one belonging to Augustus Allen, which was sold to Menard in 1839. It still stands today. Once the ten businessmen began their city, hotels and other commercial buildings were erected. The Strand area was filled with wholesalers, cotton agents and a variety of merchants. In its heyday, The Strand was known as the “Wall Street of the Southwest” and was the center of commerce for a thriving port and business community. Between 1838 and 1842, 18 newspapers were created. The Galveston News, founded in 1842, is the only one surviving today. It now is published as, The Galveston Daily News and it is the oldest daily newspaper in the state. Galveston’s prosperity was brought to a sudden halt when a hurricane struck the island on September 8, 1900 It still is considered the deadliest natural disaster in United States history. The storm brought winds greater than 120 miles per hour and a tidal surge that swept across the island; it killed over 6,000 people and destroyed most of the buildings in its path. At the time of the hurricane, Galveston had 38,000 residents and ranked fourth in population in Texas. However, one-third of the city was destroyed during the storm. In the aftermath of the hurricane, city leaders decided that if the city was to be rebuilt, it needed strong protection from the sea. To that end, the city built a seawall seven miles long and 17 feet high and began a tremendous project to raise the grade of the entire town. The project was completed in 1962, and the total cost of the seawall was $14,497,399. Today, the seawall stretches for more than 54,790 feet and protects one-third of Galveston’s ocean-front. During the grade raising, homes were jacked up, and dredges poured four to six feet of sand beneath them. Structures that could not be raised, such as 1859 Ashton Villa at 23rd Street and Broadway, had fill poured around their foundations. Residents used elevated wooden sidewalks to walk through town during the eight years it took to complete the raising of the 500 city blocks. Building the seawall saved the city from both the devastation of future hurricanes and from being a memory of Texas history. Galveston quickly gained notoriety across the country for the efficiency and determination it displayed while building the seawall. The engineering feat was noted as an example of how a city should respond after a disaster such as the 1900 hurricane. While Galveston was rebuilding from the Storm of 1900, Houston was growing. Houston dredged a channel and created a deep-water port to compete with Galveston’s. It soon became the preeminent port of Texas and surpassed Galveston’s annual tonnage. 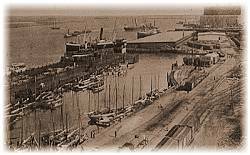 However, Galveston overcame that obstacle and turned to other business and commerce to maintain its economic base. 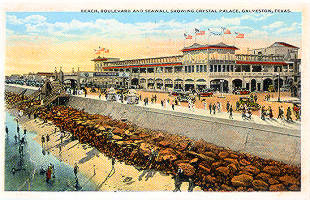 Lavish hotels and bath houses were built along the waterfront, making Galveston a playground for the wealthy, and grand homes were built in Galveston’s neighborhoods. Like any town, Galveston has suffered economic down turns, but it has always managed to rebound. Today, developers continue to build large hotels, entertainment centers, and restaurants, and each of these attract more visitors to Galveston. Downtown, a vibrant commercial center has been developed in the historic Strand district. More private residents have moved to the city to find their piece of Galveston history in the its Victorian houses. The west end of the island has grown considerably in the latter part of the 20th Century, and beach-front communities continue to be built despite the ever-looming threat of hurricanes. The city has three college campuses, two state university branches, and one community college. The University of Texas Medical Branch is Galveston’s single largest employer. Amid the historic buildings located downtown is a white skyscraper that is the headquarters for American National Insurance Company. Today, Galveston can boast of more than a dozen historic museums and properties open to the public, miles of beaches, an aquarium and a rainforest enclosed in glass pyramids at Moody Gardens, boat tours of the harbor, and air tours of the island. Additionally, three live theaters showcase top talent in Broadway musicals and award-winning plays, and Galveston’s art district features local and national artists. Contact us for all of your Galveston real estate needs.